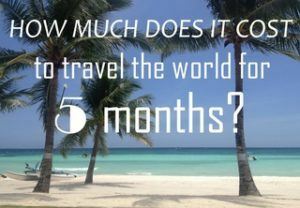 You are here: Home / Southeast Asia / Philippines / How Much Does It Cost To Travel To The Philippines? After spending a month and a half in New Zealand, I was positively surprised by the cheap prices in the Philippines! Never having traveled outside Europe before and therefore being used to a pretty high price level, I was completely amazed to find out that you can get a whole meal for just a 100 peso (about 2 euro). 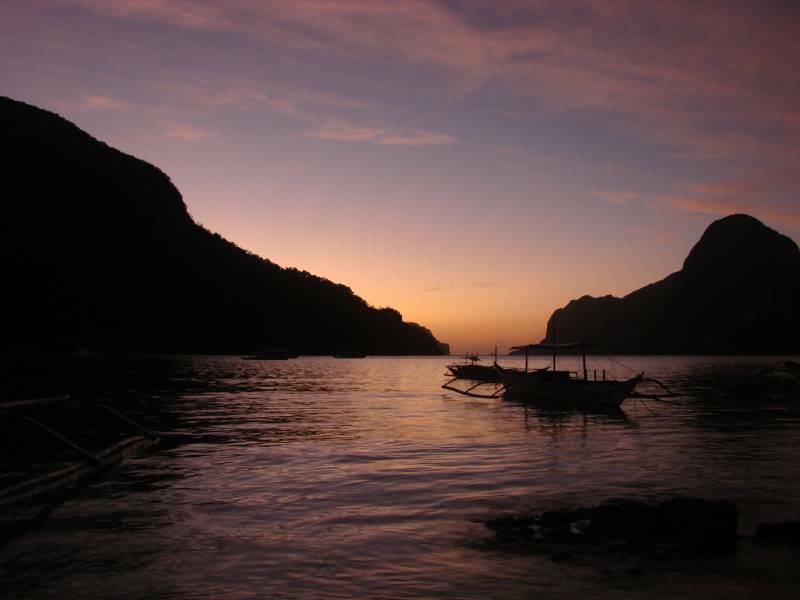 Traveling to the Philippines had been a dream of mine for years. To be more precise, since the moment I found out one of my favorite TV shows (Survivor or Expeditie Robinson as it is called in the Netherlands) was recorded there. The islands I saw on the show were just perfect. Everything you ever imagine about a tropical island. Palm trees. Coconuts. White sand. Jungle. Clear blue ocean. Colorful fish. The only thing missing was a hammock, but hey, it’s a TV-show about survival;-). I dreamed about going there one day to see such beauty with my own eyes. And after years of dreaming that’s exactly what I did! Have you been dreaming about visiting this amazing country too and are you interested in the costs of backpacking around the Philippines? Keep reading, in this post I’ll try to answer all your questions! 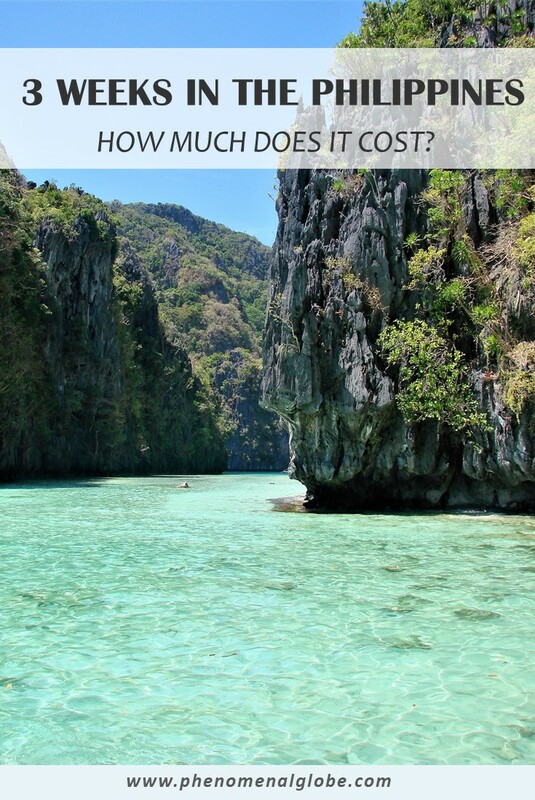 How much does it cost to travel the Philippines? In this infographic you can see a summary of all our expenses in the Philippines. I traveled the Philippines with my husband, all expenses mentioned are for the two of us together. Because the exchange rates varies from day to day, I quoted all prices in Philippine peso (php). When we where in the Philippines (February and March 2015) the exchange rate was approximately 50php for €1 and 45php for $1. In total we spend 56650php (= €1133 = $1259) during the 3 weeks we spent in the Philippines. This comes down to an average of 2833php (=€57 = $63) per day and includes all expenses in the Philippines. 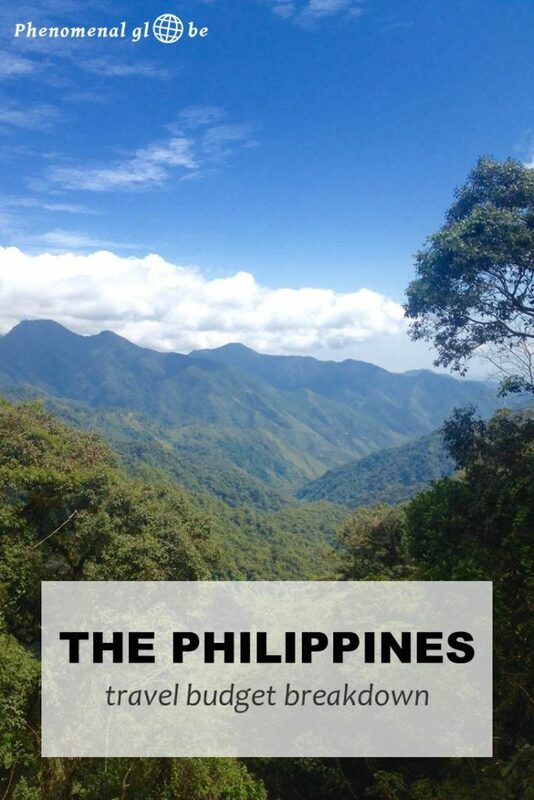 As you can see, it’s definitely possible to travel the Philippines on a budget! This budget breakdown does not include the plane ticket from Hong Kong to Manila and the plane ticket from Manila to Hanoi. 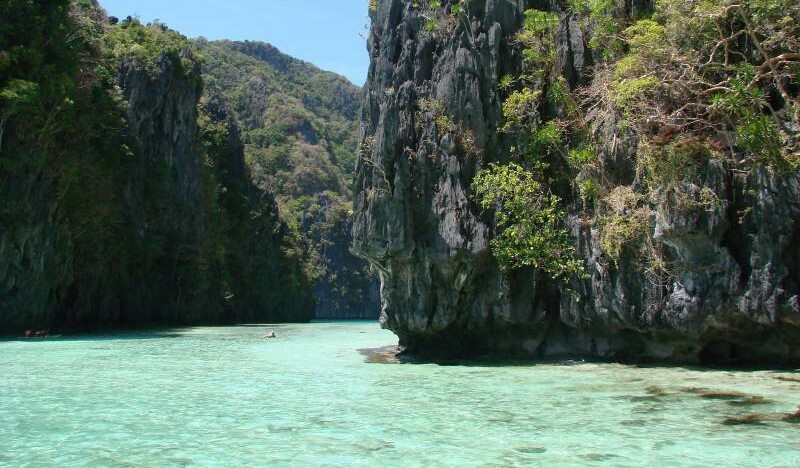 We visited three islands in the Philippines: Luzon, Palawan and Bohol. Good accommodation doesn’t have to be expensive in the Philippines! 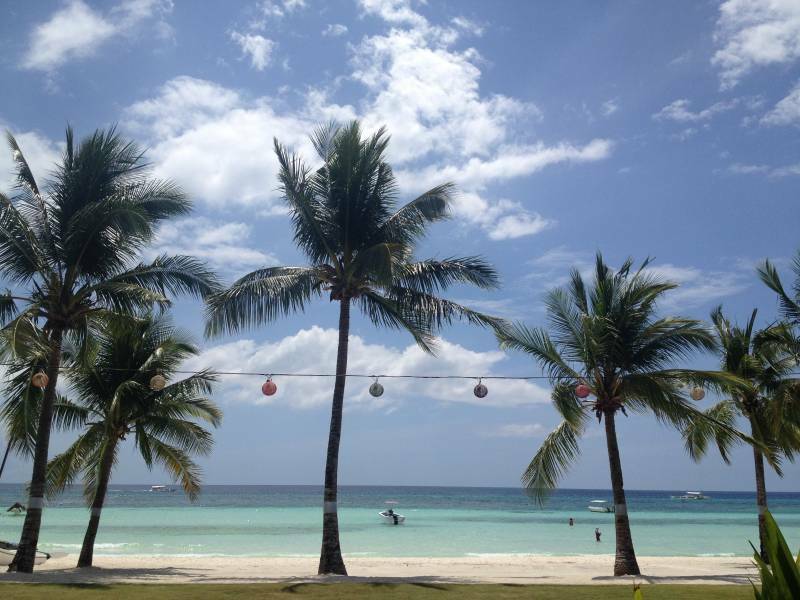 In total we spend 14500php (€290/$322) on accommodation, averaging 725php (€14,50/$16,10) per day. We stayed at a private room with our own bathroom most of the time, sometimes even with breakfast included! In the table below you can find the places I stayed at (only the ones I recommend! ), you can find more details about the accommodation in my 3 week Philippines itinerary. Accommodation discount: if you have never traveled with Airbnb before you can get €30 of your first Airbnb stay with this link! You know the beautiful tropical island I was talking about at the beginning of this post? There are more than 7000 of them in the Philippines! This means that to get from one place to another, you will have to take a flight every now and then. Enter Cebu Pacific. They have regular peso sales where you only pay taxes for your flight. Not a bad deal. If you are planning a trip to the Philippines, I strongly suggest to keep an eye on their site because these seats sell out fast. From Manila we took a night bus to Banaue, a journey of around 355 kilometers. The good thing about taking a night bus is that is saves you a night of accommodation costs and a day of valuable time. The downside of traveling by bus? Sometimes a night bus is just a regular bus, meaning you try to sleep sitting up while driving over the most bumpy road ever so your head keeps banging into the window or against the head of your neighbor:-). 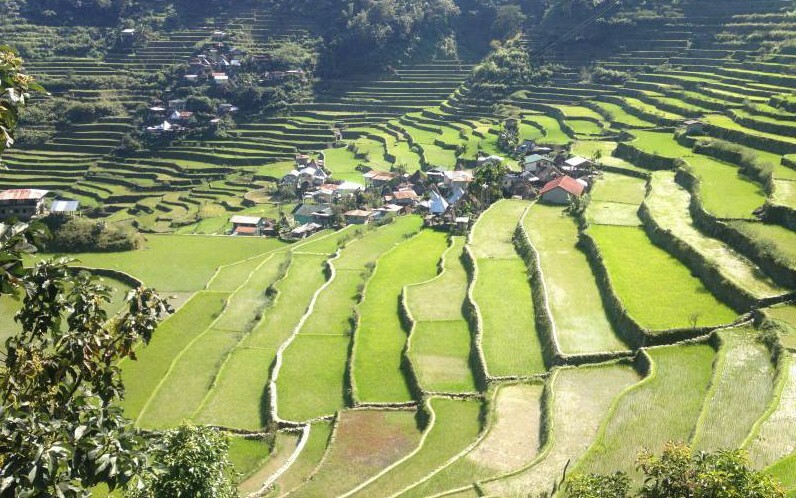 Totally worth it though, because the ancient bus did manage to get us to Banaue where we got to hike the incredible rice terraces! A small oversight on my part in my research before going to the Philippines was failing to notice that there is an airport in Tagbilaran. Which lies on Bohol. Which was where we wanted to go. Instead, I booked a flight to Cebu city, meaning we had to take a boat to get to Bohol. Not a problem, there were plenty of boats. On the way to Bohol we took a boat from Cebu Pier to Tubigon, costing us 590php. On the way back we took a boat from Tagbilaran to Cebu Pier at a total price (including luggage and terminal fees, whatever works to get more money from tourists;-) of 1030php. When writing this post I considered splitting the costs per type of transportation. But then I started counting and realized we traveled with 10 different types of transportation vehicles! Yes I was pretty amazed too! You already know about planes, night buses and boats. We also traveled in a jeepney, a tricycle, taxis, a public bus, a minivan, a scooter and last but not least: a private car. Read all about getting from A to B in my trip itinerary. You already know about planes, night buses and boats. We also traveled in a jeepney, a tricycle, taxis, a public bus, a minivan, a scooter and last but not least: a private car. Read all about getting from A to B in my trip itinerary. In total we spend 19800php (€396/$440) on food, averaging 990php (€19,80/$22) per day. After cooking our own meal in the back of our camper van for one and a half month in New Zealand, eating our three times a day was a nice change. I did get sick, like pretty much anyone traveling to Asia for the first time, but only for a couple of days. I have to admit, the Philippines was not my favorite food country in Asia. It’s not as varied and spicy and incredibly delicious as the food in Vietnam. Or Malaysia. Or Thailand. Hmm, I’m getting hungry just thinking about it. Nevertheless, we ate some really good food as well, particularly at Oasis Resort and Seaquest Divers on Alona Beach. Now you know all about the costs of traveling the Philippines. I had an amazing time and it completely lived up to my tropical island vision, so I totally recommend going there! Below you can download the budget breakdown infographic. If you have questions, leave a comment or send me a message! 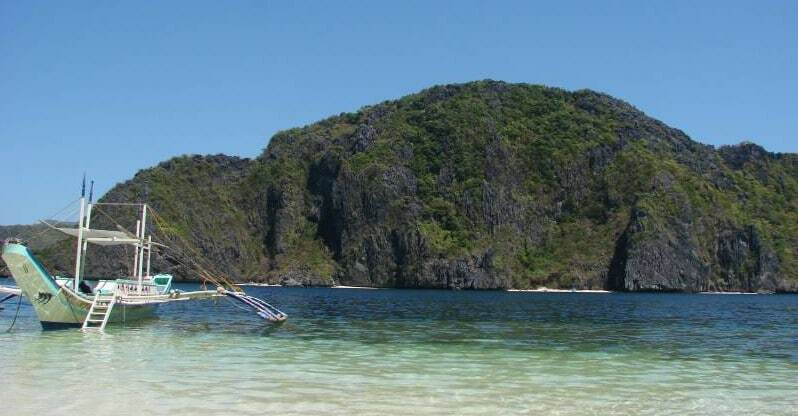 Important note: we did a PADI Open Water Course in El Nido. I did not include those costs in the budget breakdown because I feel this would not be a fair representation of the daily costs as not everyone will go diving. I recommend you do by the way, it is amazing, I love diving! Wat een overzichtelijk manier om je uitgaven bij te houden! Zeker handig voor toekomstige reizigers. Ik vond Luzon het meest speciaal. Prachtig, al die rijstvelden. Dank Jenny:-) Ik vond Luzon ook fantastisch, ik had nog nooit in mijn leven rijstvelden gezien en dan meteen zulke fenomenale als die van Batad! Wauw zeg, zo uitgebreid en in detail. Hier gaan veel toekomstige Fillipijnen-bezoekers écht iets aan hebben. Bij mij kruipt deze bestemming ook steeds hoger op het lijstje, zeker na het zien van jouw foto’s! Die infographic is super handig. Wat een super mooie infographic is dat zeg! Helemaal zelf in elkaar geflanst? En 57 euro met z’n 2’en is een mooi bedrag! Heb je hier een app voor gebruikt om dit bij te houden? Mmmmm… dat eten! De Filippijnen lijken me schitterend. Die stranden! En knalgroene rijstvelden, daar hou ik ook van. De Filipijnen zijn echt prachtig, zeker de moeite waard ondanks dat het eten een beetje tegenviel;-) Gelukkig hebben we daarna nog heerlijk gegeten in de rest van Zuidoost Azië!